Inflammatory bowel disease (IBD) consists of ulcerative colitis and Crohn’s disease, progressive, inflammatory disorders of the intestinal tract. IBD has a prevalence of 150-300 per 100,000 and some ethnic groups, such as Ashkenazi Jews, have a particularly high incidence. Ulcerative colitis is limited to the colon and involves diffuse mucosal inflammation, while Crohn’s disease may affect any part of the gastrointestinal tract and is characterized by patchy, transmural inflammation. The fundamental symptom of ulcerative colitis is bloody diarrhea, though abdominal pain, urgency and tenesmus can also occur. Crohn’s disease symptoms typically include abdominal pain, diarrhea and weight loss. There is currently no cure for IBD and treatments aim to control symptoms, encourage remission and avoid relapse; unfortunately, treatments such as corticosteroids and immunosuppressive drugs can cause secondary health problems. Animals are given DSS-treated drinking water for 6 days and are evaluated daily for survival, body weight, evidence of bloody stool and diarrhea. 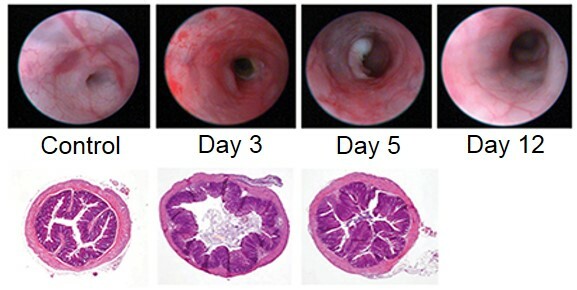 Endoscopy occurs on days 3, 5, 7, 12 and 21; after animals are sacrificed, colon length and weight are determined and colon histology is performed. In classical IBD models, the measure of mucosal healing has been under-assessed, since the primary endpoint of histology mandates animal sacrifice and precludes the continual tracking of disease course. 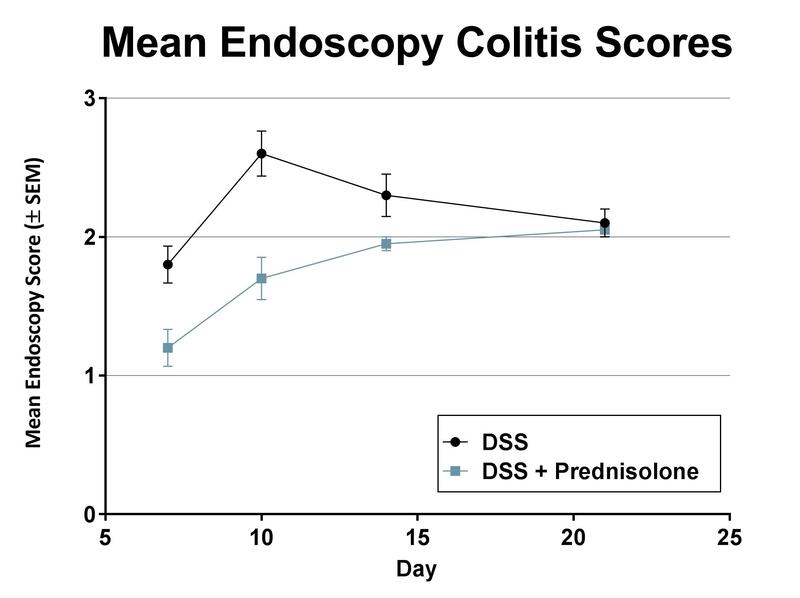 The use of video endoscopy for these models provides a method for daily visual assessment of the severity of colitis as well as tracking of mucosal healing following a therapeutic intervention. Animals are given DSS-treated drinking water according to a 5 days on, 7 days off cycle for a period of 3 cycles and are evaluated daily for survival, body weight, evidence of bloody stool and diarrhea. 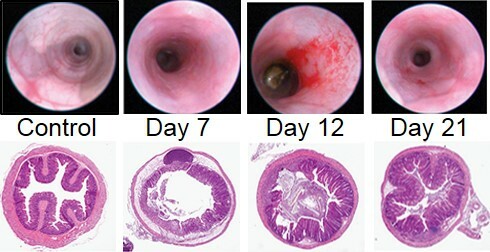 Endoscopy occurs on days 11, 18, 26 and 35; after animals are sacrificed, colon length and weight are determined and colon histology is performed. In classical IBD models, the measure of mucosal healing has been under-assessed, since the primary endpoint of histology mandates animal sacrifice and precludes the continual tracking of disease course. 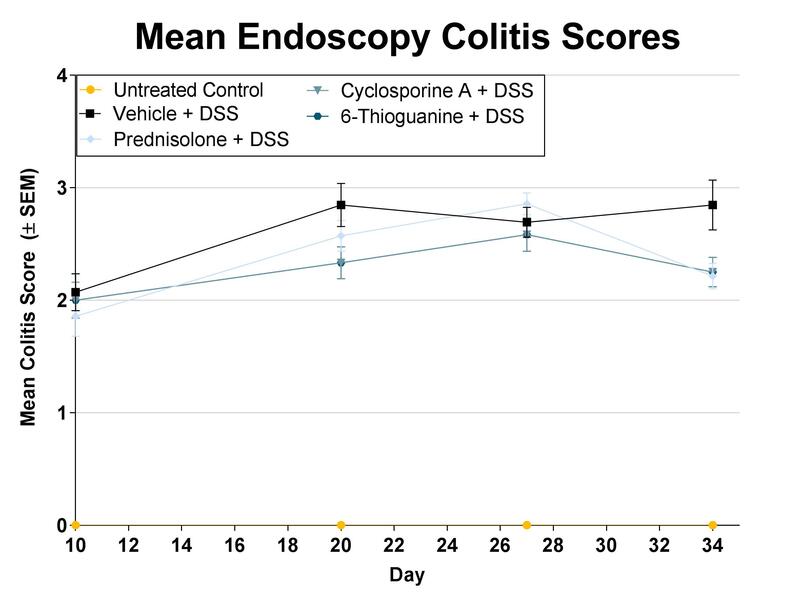 The use of video endoscopy for these models provides a method for daily visual assessment of the severity of colitis as well as tracking of mucosal healing following a therapeutic intervention. Animals receive a single intrarectal dose of TNBS and are evaluated daily for survival, body weight, evidence of bloody stool and diarrhea. Endoscopy occurs on days 3 and 5; after animals are sacrificed, colon length and weight are determined and colon histology is performed. In classical IBD models, the measure of mucosal healing has been under-assessed, since the primary endpoint of histology mandates animal sacrifice and precludes the continual tracking of disease course. 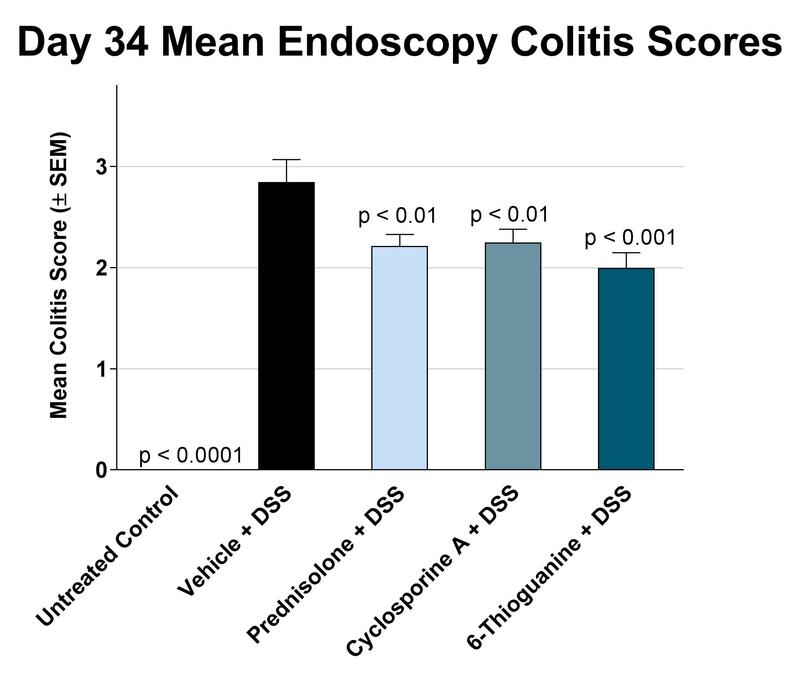 The use of video endoscopy for these models provides a method for daily visual assessment of the severity of colitis as well as tracking of mucosal healing following a therapeutic intervention. Animals receive a single intrarectal dose of Oxazolone (OXZ) and are evaluated daily for survival, body weight, evidence of bloody stool and diarrhea. Endoscopy occurs on days 3, 7 and 10; after animals are sacrificed, colon length and weight are determined and colon histology is performed. 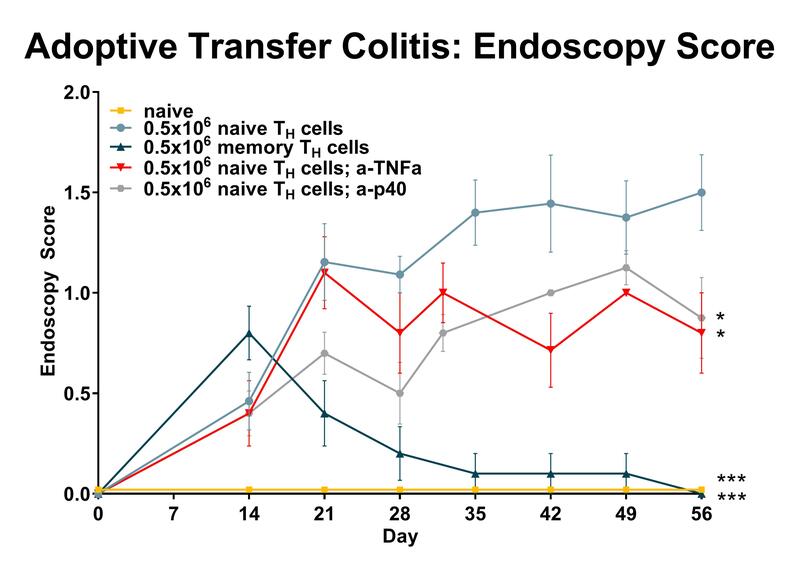 In classical IBD models, the measure of mucosal healing has been under-assessed, since the primary endpoint of histology mandates animal sacrifice and precludes the continual tracking of disease course. 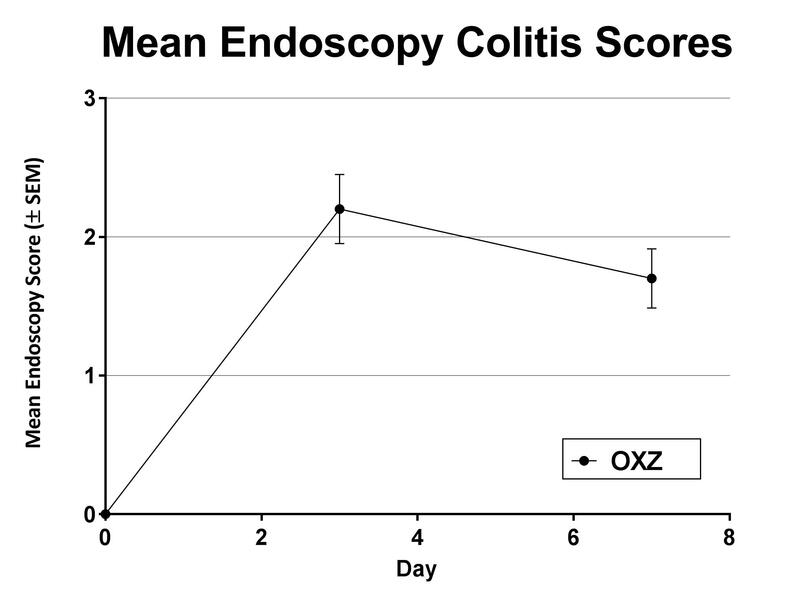 The use of video endoscopy for these models provides a method for daily visual assessment of the severity of colitis as well as tracking of mucosal healing following a therapeutic intervention. 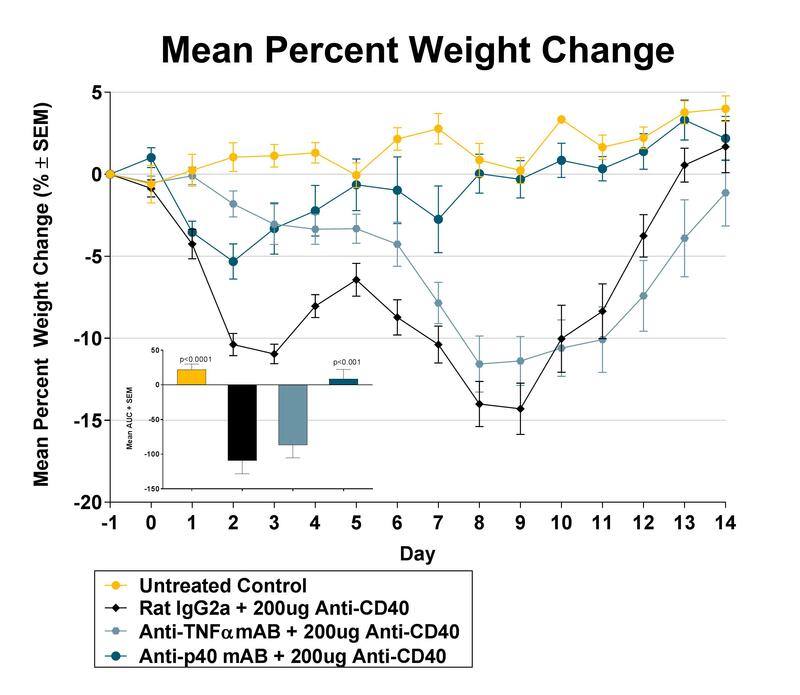 Animals are given a single intraperitoneal injection of an agonistic CD40 mAb, which is dependent upon tumor necrosis factor-α as well as interleukin-12 p40 and interleukin-23 p40 secretion, for disease induction. The benefit of this particular model is it allows investigators to probe the contribution of inflammatory cytokines in the disease’s progression. Animals are evaluated daily for survival, body weight, evidence of bloody stool and diarrhea. Endoscopy occurs on days 3, 7 and 14; after animals are sacrificed, colon length and weight are determined and colon histology is performed. 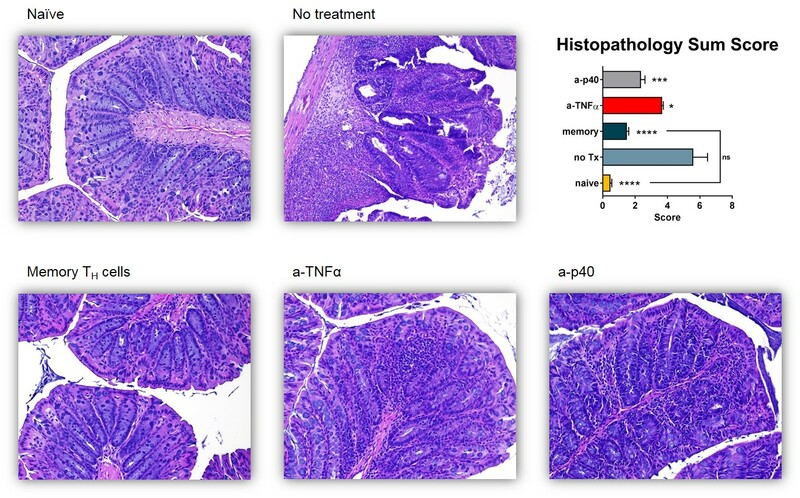 In classical IBD models, the measure of mucosal healing has been under-assessed, since the primary endpoint of histology mandates animal sacrifice and precludes the continual tracking of disease course. 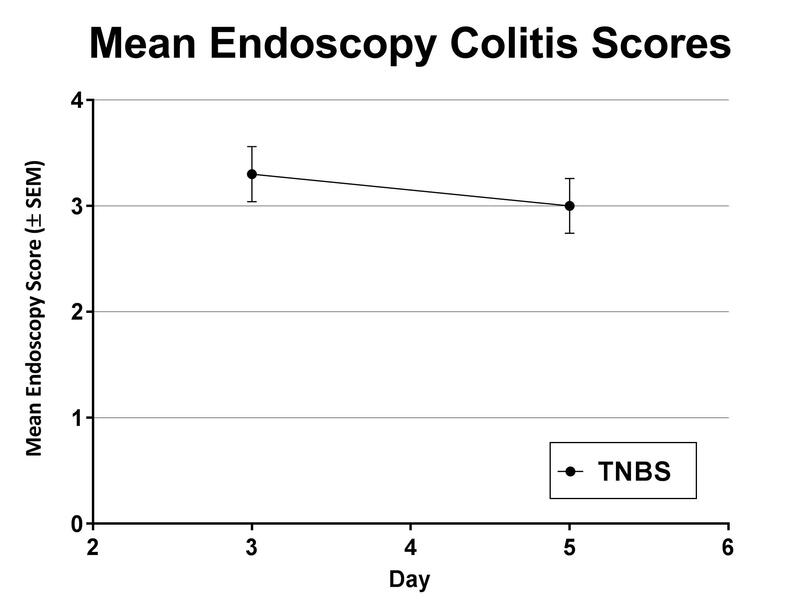 The use of video endoscopy for these models provides a method for daily visual assessment of the severity of colitis as well as tracking of mucosal healing following a therapeutic intervention. 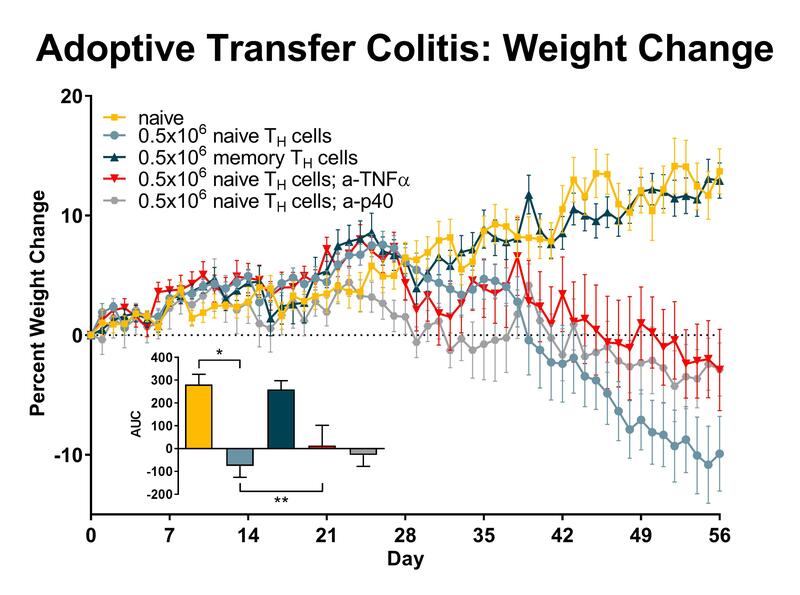 In the adoptive transfer model, donor cells are harvested from the spleens of C57Bl/6 mice and naïve TH cells are sorted by a combination of negative magnetic separation and/or flow cytometry. 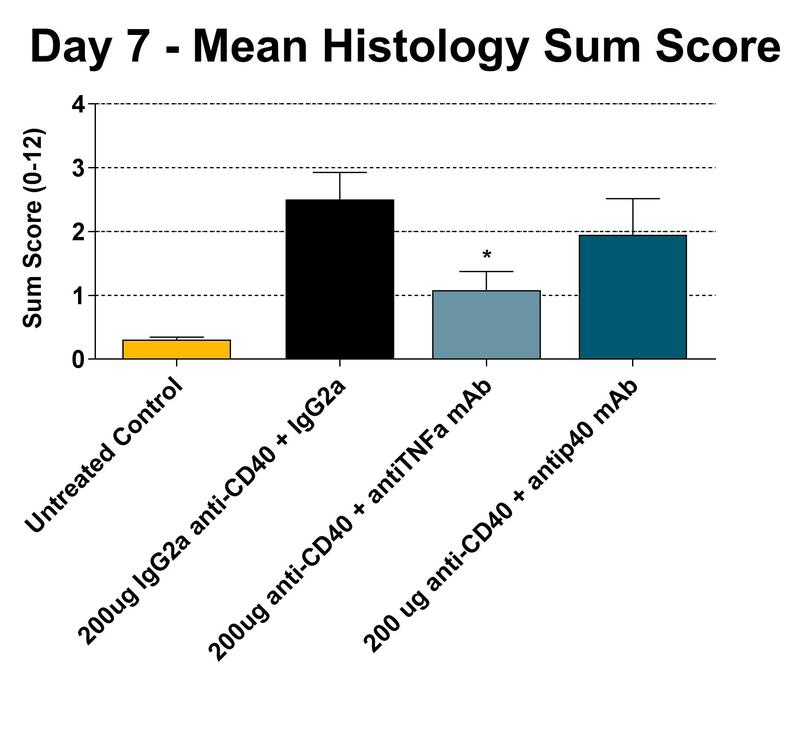 Cells are transferred intra-peritoneally into MHC-matched RAG2-/- recipients at 0.5×106 cells per dose. 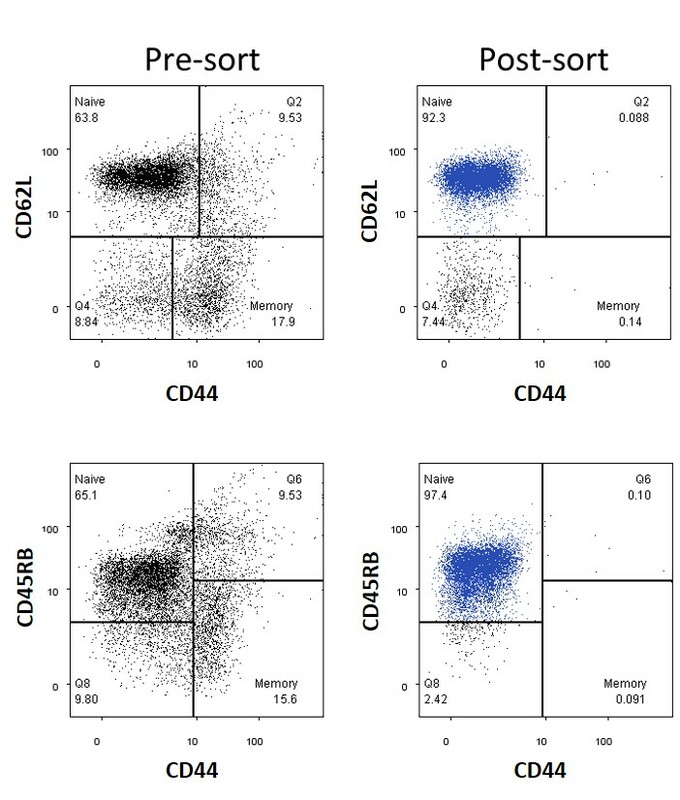 Naïve T cells are defined as either CD4+, CD45RBHIGH, or CD4+, CD44-, CD62L+; the two sorting methods result in models with comparable disease course, duration, and outcome. Mice are weighed and monitored daily for signs of disease, and blood can be drawn regularly to assess engraftment. 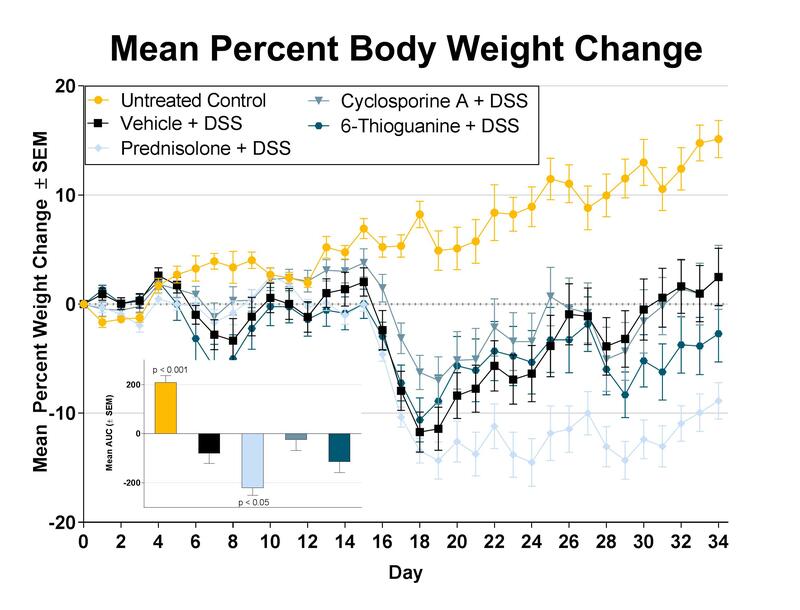 Day 14 CD4+ T cell count in peripheral blood correlates strongly with endpoint weight loss and endoscopy score, and therefore can be used to stratify mice prior to the onset of weight loss. Colonoscopies are performed at regular intervals following the onset of observed morbidity. Disease onset is expected to occur at 3-5 weeks post-transfer. 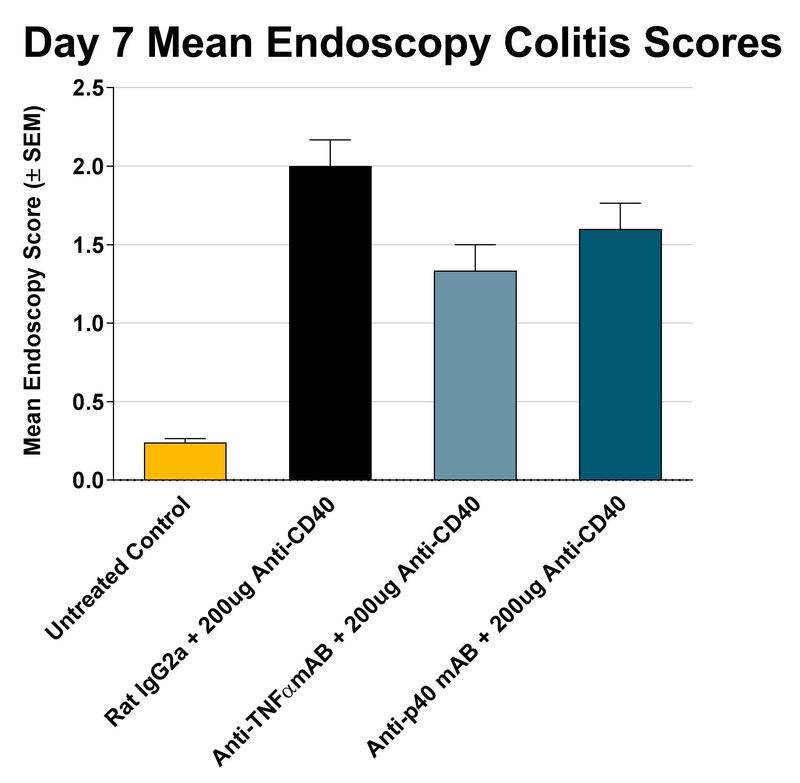 Study endpoints include endoscopy colitis scores, weight, blood in stool, and diarrhea. In addition, organs (e.g. colon, small intestine, lymph nodes, etc.) can be removed and processed for further evaluation by histology and/or cellular characterization by flow cytometry. Most studies using this model rely on weight loss data alone to determine time of onset and severity of disease. Biomodels provides an extra level of clinically relevant disease evaluation by using serial colonoscopies to visualize extent and severity of colitis during the course of the model, as well as histological examinations of preserved tissues.